Considered too obscene to be staged in its original form for nearly 200 years, William Wycherley's bawdy comedy tells the tale of Mr Horner - a notorious rake who spreads the false rumour that he is impotent in order to gain free access to other men's wives. 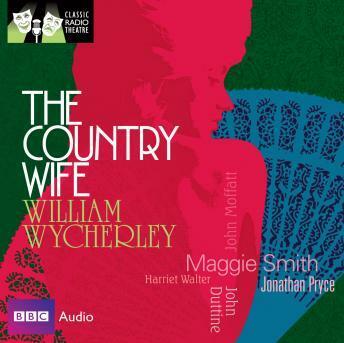 When he meets the young, innocent Margery Pinchwife, the 'country wife' of the title, the scene is set for scandal... This sparkling 1985 BBC Radio production stars Maggie Smith as Margery Pinchwife, with an all-star cast including Jonathan Pryce, John Duttine, John Moffatt, Harriet Walter and Michael Aldridge. '... a delight for its sparking wit and the window it offers into Restoration manners and morals' - Times.